Growing up, artist Brian Korte always had a plastic tub of LEGOs handy. He was fond of building all sorts of things, but Brian says he really enjoyed building castles. Now, years later, LEGOs are the foundation of Korte’s artwork. His latest exhibit Vibrance: Lego Art by Brickworkz / Brian Korte opens Thursday, May 31, at the Cultural Arts Center at Glen Allen with a reception from six to nine o’clock. Korte became interested in building when he was six years old. While his brothers were playing or watching sports, he would be working on his LEGO collection. “It was a lot of fun,” he says. He shuttered his collection during high school and didn’t pull it out again until after getting his degree in advertising from Radford. When he was working as a web master, he needed an activity that was far removed from the digital world. “I was doing my own cross-stitch patterns and I started doing my own LEGO mosaics,” he says. 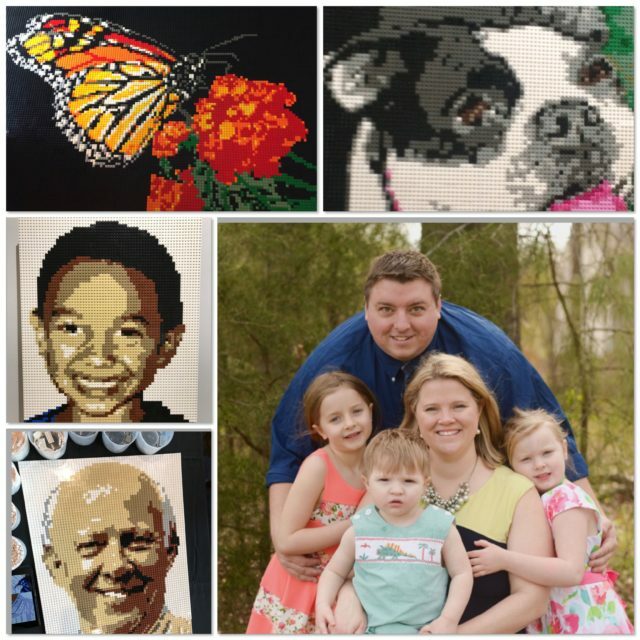 He made his first LEGO mosaic portrait in 2004 as a wedding present for two friends. Later, he created a 9,000-piece mosaic commemorating several road trips the friends had taken together. “I did one for myself afterward,” Korte says. Most of his customers are out of state and some are international. “Within four to five months of starting the business, someone from Israel reached out. I did a huge project for them,” he says. Since then, he has completed a project for the Crown Prince of Bahrain – a portrait of each of the Prince’s twin sons – as well as projects for Airbnb in Copenhagen. He has also done projects for different companies in London, Ireland, Canada, Hong Kong, Australia, Singapore, and Thailand. A few of his projects have been collaborative despite being overseas. “One project in the United Kingdom became a community-wide project,” he says. Most often customers send in photos and Korte designs the portrait, many of which are anniversary portraits or portraits of children or pets. “I build it and ship it out to them. 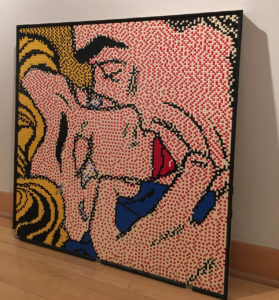 It arrives ready to hang,” he says, adding that an average portrait contains between 9,000 and 14,000 LEGO bricks. Every once in a while, he is commissioned for a special memorial project. He embraces those projects. “Being able to help a family grieve is pretty powerful,” he says. Commissions represent 40 percent of his work. The remaining 60 percent is corporate, everything from office décor to teambuilding events. His “most fun” project is the one he hated to part with: the Star Wars Millennium Falcon going into light speed. “It was for a couple in Houston for their 6-year-old son. I wish I could have kept that one,” says Korte, who is a huge Star Wars fan. His work is something he shares with his wife, Molly, and their three children 8-year-old Emma, 6-year-old Mary Grace, and 3-year-old Jacob who is on the autism spectrum. Molly founded the nonprofit Project Just Like You celebrating the lives of people with special needs after Jacob’s diagnosis. The family lives in Moseley. “We all play with LEGOs. We have a good time,” Korte says. The kids will help dad from time to time. “They will pick things up or put some pieces down. It’s a good bonding opportunity,” he says, adding that he and his wife try to keep Jacob out of the LEGO work zone at the moment because of his toddler curiosity. He feels blessed to have a job where he can work from home and spend time with his family. “I feel like I’m present more than when I was working in IT,” says Korte who won the 2009 Theresa Pollak award and was listed in Style Weekly’s Top 40 under 40 last year. His exhibit at the Cultural Arts Center at Glen Allen will feature past and new works that include a memorial portrait of his father-in-law, Dr. Michael McMunn, who passed away in 2017. He feels something special when he looks back at his art, especially the memorials for people who have passed away and the mosaics he’s done for wedding anniversaries. “It’s a real honor to be a part of that,” he says. To learn more about Brian’s art, visit BrickWorkz.com.